Solihull Medical Cosmetic Clinic, led by Dr. Sagoo, is one of the very few leading acne scarring clinics in the UK to offer a full range of scar treatments, and receives referrals from GPs as well as private hospitals. Acne scarring is a reaction to the inflammation in the skin caused by acne. During the inflammatory process, tissue is destroyed. As the body attempts to heal the skin, a reaction called fibrosis occurs. Fibrosis leads to changes in the texture of the skin that can make it thinner (called atrophic) or thicker (called hypertrophic) than normal skin. Scarring is permanent. Thus, treating acne early, before scar formation and discoloration, is crucial. Post Inflammatory Hyperpigmentation – brown/black discoloration at the site of the acne lesion – which is very common in darker skin toned individuals or in those who tan easily and can significantly worsen the appearance of acne. If the scars are depressed and they disappear when you stretch the skin, laser often helps, in many cases significantly. If the scars are what we call “ice-pick scars”, meaning they don’t change even if you stretch the skin, then laser is much less likely to work for you. Filler materials, such as hyaluronic acid fillers, may be effective to fill in depressed scars, especially if they are distensible. Pigmented scars may be improved with prescription bleach creams. Chemical peels e.g. TCA peels (hyperlink) may also help reduce the pigmentation and scarring. Elevated scars may be improved with injections of a mild cortisone to flatten them. This involves the use of abrasive tools to remove the outer layers of the skin to produce an improved appearance. Dermabrasion may improve the appearance of acne scarring; this is one of its primary uses. Dermaroller is a relatively new technique to improve depressed scars by using small rollers with multiple microneedles to cause trauma to the scar, which may result in new collagen formation. Over a course of treatments, this may cause softening of the scars. Solihull Medical Cosmetic Clinic is the only clinic in the UK to use the FRX CO2 fractional laser for acne scarring, which may give impressive results in many patients. 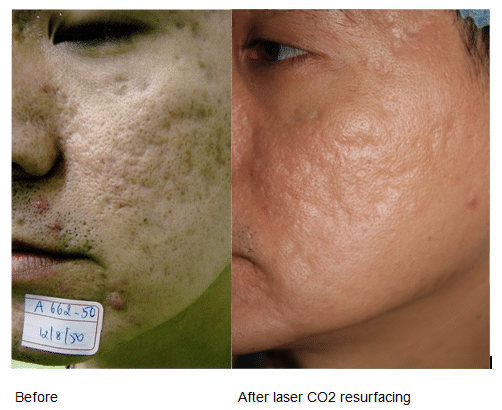 The CO2 laser is still considered the gold standard among lasers. 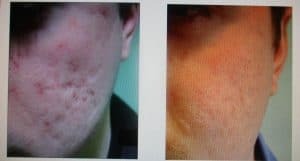 Laser resurfacing has been used for acne scarring for years. All lasers use a high-energy beam of light that targets specific structures in the skin. The CO2 laser resurfacing is ablative, meaning that it destroys the outer layers of the skin, which may then stimulate the skin to repair itself. Ablative techniques are more effective but less popular because they require recovery time. The fractional CO2 laser is not recommended for dark skin. For Asian skin acne scarring. Dr. Sagoo through his years as a laser expert has devised laser and combination programmes to treat Asian and dark skin safely but without the unwanted risks associated with laser resurfacing. Subcision is used for atrophic scarring. Local anesthesia is used and a needle is then inserted under the scar and gently moved underneath the skin, which may help to release the scar tissue and improve the appearance of the scar. 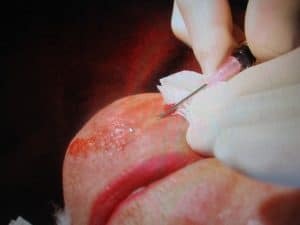 Punch excision followed by grafting is the only effective treatment for deep ice pick scars, because it completely removes the scar. A sharp device (called a punch) is used to cut out the area of the scar and the edges of the wound are sewn together with a stitch. In this case, a deep, large scar is traded for a tiny line scar that can later be treated to further blend into the rest of the skin. To book a free consultation and assessment of acne scarring please call us on 0845 603 6150. What is FRACTORA and what does it do? Fractora is the most advanced fractional radio frequency (RF) treatment, which may provide anti-aging improvements to skin tone and texture for a more radiant appearance, through ablation and skin resurfacing. Ablative treatments do remove some skin, so they have more downtime than other non-ablative technologies like IPL and FotoFacial. Fractionated RF energy found in Fractora has been shown in scientific studies to reduce wrinkles. It is minimally invasive, using a matrix of micro-pins that may resurface and restore the skin, and can provide exceptional results for many patients with almost no patient downtime. 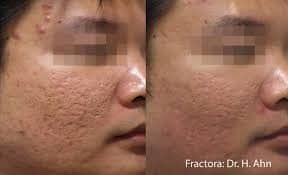 Fractora is designed to deliver targeted bipolar RF energy to various selectable depths in the skin. Fractora can meet or even exceed the results of fractional CO2 without the associated downtime, prolonged redness, and pigmentation drawbacks. 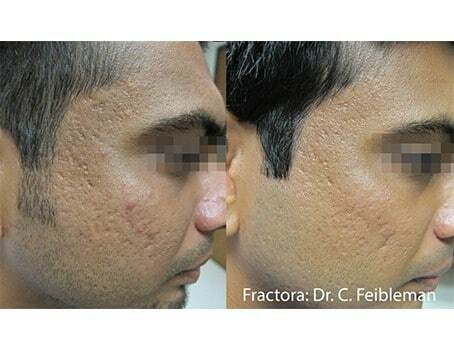 Fractora may achieve full-scale treatment depths with customizable fractional energy, which may improve a variety of skin problems ranging from superficial skin tone problems (photo damage) to deep textural concerns (rhytids and tightening). Variable depths, densities and energy levels are used to give the possibility of results that were previously unattainable without excisional surgery. Fractora is the most advanced fractional radio-frequency treatment which may provide anti-aging improvements on skin tone and texture, which may create a more radiant appearance through ablation and skin resurfacing. Fractora delivers RF energy to the skin through an array of pins, which produces localized heat and small micro-lesion dots in the treatment area. The gentle heat generated by the Fractora pins in the sub dermal tissue may promote collagen restructuring for skin rejuvenation and an improved appearance in the skin. The methodical scattering of micro-lesions may allow the skin to heal faster than if the entire area was ablated. Fractora may deliver improvements in a broad range of symptoms of aging skin including fine lines, deep lines, texture, pigment irregularities, blood vessels and redness. Fractora may offer improvements for aging skin that would previously have required 2, 3 or even 4 different technologies. Ablation of the skin promotes skin resurfacing while untreated skin between the pins may promote faster healing of the treatment tissue. Versatility of parameters allows the treating professional to vary the depth of ablation, coagulation and heating. Subcision is used for atrophic scarring. Local anesthesia is used and a needle is then inserted under the scar and gently moved underneath the skin, which may help to release the scar tissue and improve the appearance of the scar and stimulate new collagen production.Dr Sagoo is highly skilled in advanced subcision techniques to free scar tissue.